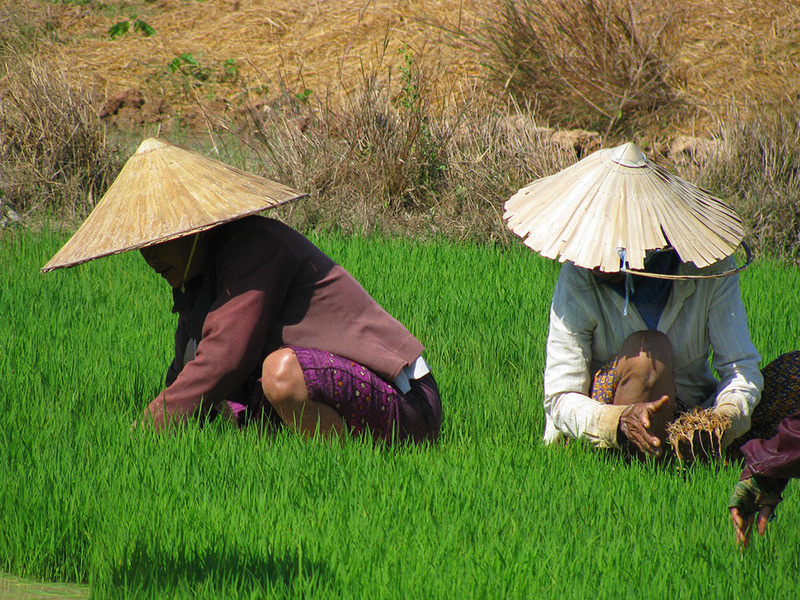 This photo was taken by Charles Pieters and shows two women working in the paddy fields in Laos, south-east Asia. Here’s a link to more of Charles’s work. If you have a photo you would like to see featured on the site, please tweet: @thegreenveggie or get in touch via facebook: Thegreenveggie. Chinese cuisine is not always ideal for vegetarians. I’ve often ordered a vegetarian chow mein, only to discover a rogue prawn hidden beneath the noodles. But Cardiff’s Happy Gathering provided an extensive vegetarian menu. Situated in Canton, Happy Gathering was named “Cardiff’s finest Chinese restaurant,” by the Independent. From the outside, the shabby neon sign certainly didn’t distinguish this restaurant from the countless Chinese take-aways on Cowbridge Road East, but the food turned out to be exceptional. The restaurant was bigger than it appeared from the outside and was traditionally decorated, with a dark red and black colour scheme and oriental prints and drapes. A grand piano dominated the room and live music added to the lively atmosphere. My guests were all keen meat-eaters and were spoiled for choice with fish, duck and beef. I was expecting to have to settle for the only vegetarian option on the menu, but to my surprise, there were many vegetarian and vegan dishes available. I opted for vegetable spring rolls as a starter. These were beautifully presented on a rectangular glass plate, with the salad artistically crafted into a flower. 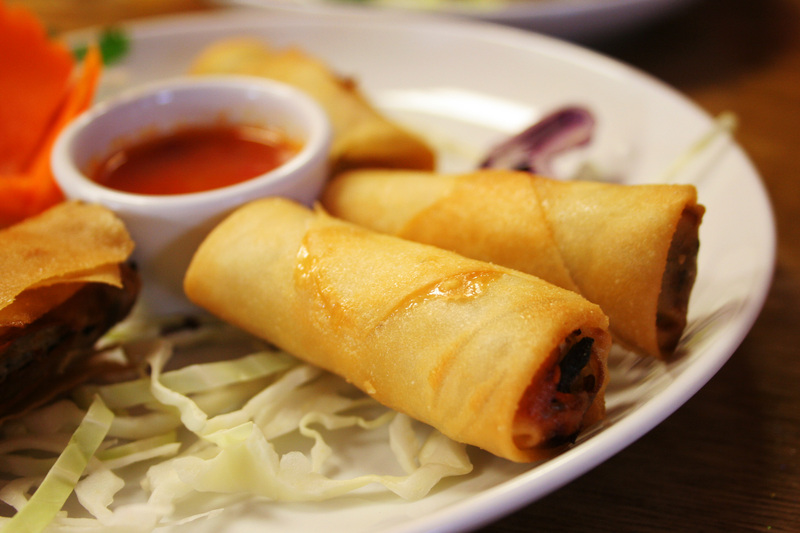 The spring rolls were filled with fresh vegetables and were deep fried, to give a light, crispy texture. The chop sticks added to the authenticity of the restaurant, but eating spring rolls in a socially acceptable manner with these awkward utensils proved a challenge. Fortunately, a few drinks made the whole thing much easier! For the main course, I ordered fried bean curd in chilli and black bean sauce with egg fried rice. This dish gave new life to the tofu, which is so often dull and flavourless. It had been marinated in chilli and then lightly fried, making it spicy and succulent on the inside and crispy on the outside. The black bean and chilli sauce was delicious, with a mild spicy flavour and hints of ginger and garlic. It went well with the egg fried rice, which was cooked to perfection and served with peas to add to the colour and lift the presentation. Although the rice was served in traditional small bowls, the portions were just right and we all left feeling satisfied. The meal was good value, with the starters priced at around £5 and the main courses priced between £10 and £15. A vegetarian set menu is available for two or more people to share, priced at £13 per person for a starter and main course.